University of California Press, 9780520232099, 406pp. One of the leading public intellectuals of twentieth-century America and a pioneering and brilliant social scientist, C. Wright Mills left a legacy of interdisciplinary and hard-hitting work including two books that changed the way many people viewed their lives and the structure of power in the United States: White Collar (1951) and The Power Elite (1956). Mills persistently challenged the status quo within his profession--as in The Sociological Imagination (1959)--and within his country, until his untimely death in 1962. 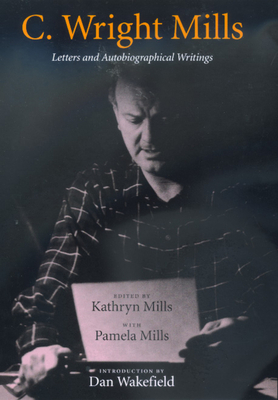 This collection of letters and writings, edited by his daughters, allows readers to see behind Mills's public persona for the first time. Mills's letters to prominent figures--including Saul Alinsky, Daniel Bell, Lewis Coser, Carlos Fuentes, Hans Gerth, Irving Howe, Dwight MacDonald, Robert K. Merton, Ralph Miliband, William Miller, David Riesman, and Harvey Swados--are joined by his letters to family members, letter-essays to an imaginary friend in Russia, personal narratives by his daughters, and annotations drawing on published and unpublished material, including the FBI file on Mills. C. Wright Mills was a maverick social scientist who taught in Copenhagen, London, and Mexico City in addition to the United States. His work has been translated into twenty-three languages. Kathryn Mills works for a book publisher in Boston. Pamela Mills teaches American literature and composition in Rio de Janeiro, Brazil. Dan Wakefield is the author of New York in the Fifties (1992), which is the basis for a documentary film, Island in the City: The World of Spanish Harlem (1959), and many other works, including the best-selling novels Going All the Way (1970) and Selling Out (1985).